The readings today speak of God’s transformative power and the temptation to live with an illusion of our own power. The key question is that of dominion. Do we choose to live in God’s world, by God’s law, or do we believe that we can create a paradise of our own. Amos, an agricultural laborer turned prophet of the Lord is an example of expectations reversed. And he threatens the elite of his day with even more radical reversals. He observes their desire to live in a world of indolent luxury; that they take no notice of those who suffer want or even of the decay of the nation around them. And so he warns them that when the collapse of their corrupt, self-absorbed society finally comes, they will be the first to suffer the consequences. His warning is very concrete as foreign powers threaten the land and will soon conquer and exile these people. But the warning is also of a spiritual nature. These men and women have forgotten that the Lord reigns over all. They have forgotten the origin of the material wealth they enjoy. They want to make their own music and they no longer sing the Lord’s song of compassion. The accompanying Psalm recalls the Lord’s special care for those who are bereft. Those who suffer loss, physical limits, oppression, poverty; these are the favorites of the Lord. As the Lord sings this song of deliverance and mercy, the just are invited to become the voice and hands of that divine compassion. In human societies, there are many models of leadership. Unfortunately, too many examples are models of selfish exploitation like that among the elites of Amos’s day. The passage from the letter to Timothy offers an ideal vision of leadership in the Christian community. It does not address the prerogatives of leadership, but focuses on the obligation of the leader to embody the highest ideals of “righteousness, devotion, faith, love, patience, and gentleness.” The letter is most distinctive in the foundation it provides for these ideals. The Christian leader will not rely on his own capacity for virtue, but upon the grace of God. The example of Christ Who lived “without stain or reproach” provides a self-emptying model of leadership. And Christ provides more than the model of such leadership, the Christian leader can rely upon the assistance of the Lord – hence a crucial part of such leadership will be the worship of the “King of kings” and “Lord of lords.” In effect, authentic authority in the Christian community begins with authentic submission to the will of God. We are all familiar with the memorable and dramatic imagery of today’s parable of Lazarus and the rich man. 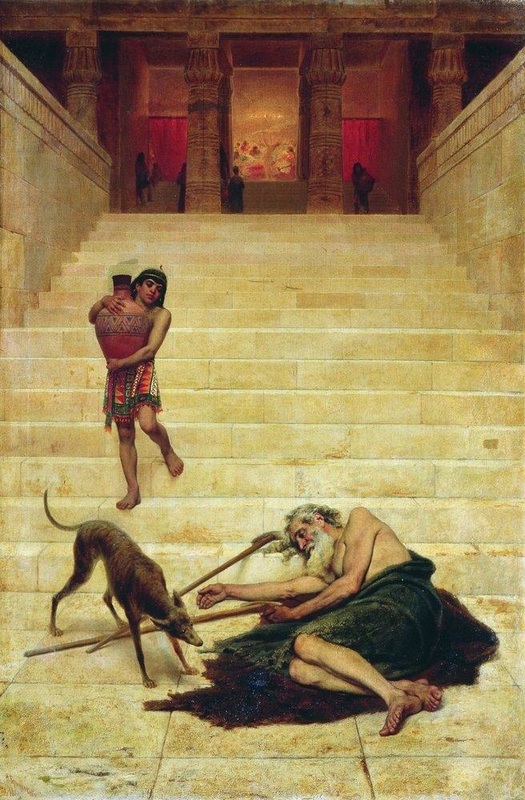 The contrast between the two men is great, in this life where Lazarus suffers so miserably and the rich man lives so sumptuously, and in the next where Lazarus finds comfort and​ deliverance and the rich man finds his fortunes reversed in the extreme. The rich man’s sin does not lie in his failure to offer a few scraps to the poor man at his gate, but in his failure to even notice the existence of the man Lazarus. In a subtle way, the parable reveals this by naming Lazarus and leaving the rich man unnamed. Like the Pharisees to whom Jesus spoke the parable, the rich man lives in a world of his own. He has forgotten the commandments of the Lord; he cannot see the truth hiding in plain sight. If he and they have Moses and the prophets and they will not see, even the miracle of one raised from the dead will not break the boundaries of the world they have created. It is always a temptation for us to live in a world of our own making. Especially with wealth and power, we can forget God and put faith in our own power. We can insulate ourselves from reality with luxury and blind ourselves with indolence. But as the parable demonstrates, this path, for all it passing pleasures, is a literal dead end. To forget God is to forget the origin and destiny of life. And to live in this way does more than spell eventual doom, it cuts us off from the truth, reality, and the richness of life now in the world of God’s creation. To live under God’s dominion is the path to consolation and life. And it is to live with eyes open to the richness of the world the Lord has entrusted to our care. It involves living in a much larger world where we have many brothers and sisters and recognize our relationship of mutual responsibility. In this larger world we may not be gods, but we can be God-like. We can give generously and love wholeheartedly. We can be compassion as well as receive compassion. Refusing to live by our own power, we can be transformed by the ultimate power. And when we have finished our course, we can hope in the compassion of the God we have served. We can hope to live again where Lazarus is poor no longer.